Nearly four years ago, a team lead by Lockheed Martin won a cost-plus contract worth more than $1.46 billion contract to build two GPS III research & development satellites. However, a recent General Accountability Office (GAO) report and subsequent confirmation by the GPS program office indicates that additional testing of key components planned for GPS III spacecraft has been the main cost driver. Projected expenditures on the first two GPS III satellites are at least 18 percent higher than first estimated, up to $1.6 billion today, according to the GAO. The foregone Lockheed Martin incentive fee, which represents about five percent of the program’s targeted budget, would offset about half of the cost increase. The GAO report, titled “Space Acquisition: DOD Faces Challenges in Fully Realizing Benefits of Satellite Acquisition Improvements,” was discussed at a March 21 hearing conducted by the Subcommittee on Strategic Forces of the U.S. Senate Committee on Armed Services. “The GPS III program has cited multiple reasons for the projected cost increases including reductions in the program’s production rate; test equipment delays; and inefficiencies in the development of both the navigation and communication payload and satellite bus,” the GAO’s written statement indicates. “The contractor is also behind in completing some tasks on schedule, but the program does not expect these delays to affect the launch of the first satellite [scheduled for 2014],” the reported indicated. Gen. William Shelton, commander of Air Force Space Command, told a press conference last month that he saw no reason for concern in the GPS III program, which he characterized as "going extremely well." According to a Space News report from the press conference, Shelton said, "We are on schedule, on target with that program," adding that the unit costs for the first two development satellites had not been finalized. Lockheed’s GPS III contract includes an additional five options of two space vehicles (SVs) each. However, the Air Force appears likely to purchase fewer than that. In January, Lockheed Martin announced that the Air Force had awarded it a $238 million contract for production of the third and fourth GPS III satellites, as well as a $21.5 million contract to provide a Launch and Checkout Capability (LCC) for the next-generation ground segment (OCX) to command and control GPS III satellites from launch through early on-orbit testing. The cost-risk for the development phase of the GPS III program remains with the Department of Defense, but will be converted to a fixed-price basis with most of the production SVs. Last month, Gil Klinger, deputy assistant secretary of defense for space and intelligence, told members of a House subcommittee that the U.S. Air Force will be shifting the GPS III program to a fixed-price contract as part of an effort to control costs. The Air Force Space Command (AFSPC) later told Inside GNSS that this could occur as soon as SV5. The testing regime reflects the “back to basics” emphasis of the GPS Directorate and Air Force acquisition officials that stresses “rigorous system engineering” and “high confidence in initial capability” of new platforms and systems. Keoki Jackson, Lockheed Martin’s navigation systems vice president, told Aviation Week that the Air Force’s requirement for additional testing was based on a recommendation from The Aerospace Corporation. The testing on the engineering “pathfinder” satellite should be a “one-time thing,” Jackson added. 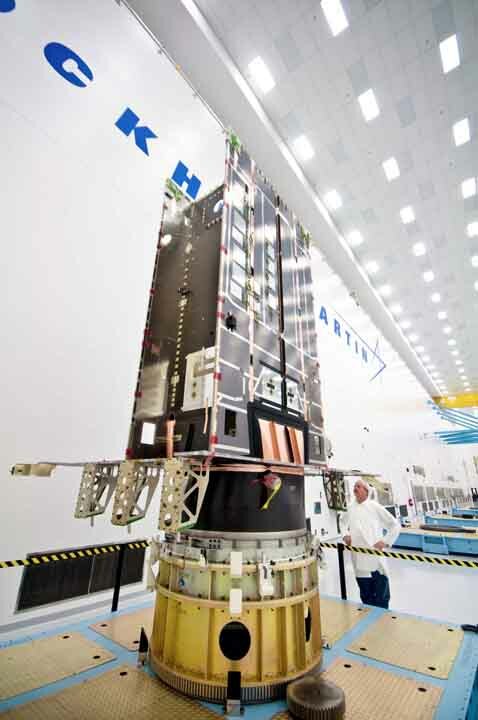 Lockheed Martin believes that by helping the contractor avoid defective components the test results will help save tens of millions of dollars in reduced costs for parts and associated labor on the production version of the GPS III, beginning with SV3. That emphasis stems in part from the Air Force’s experience with the previous generation of GPS satellites, Block IIF, designed and built by Boeing. “According to the GPS directorate, the cost of the GPS IIF program, as of April 2011, was at $2.6 billion — more than triple the original cost estimate of $729 million,” the GAO report stated, adding that the IIF satellites’ development challenges were mostly responsible for the 4.5-year delay in the launch of the first GPS IIF satellite to May 2010. “Approximately one month after they were enabled, the second IIF satellite’s Cesium clock — one of three atomic frequency standard clocks onboard that provide GPS accuracy through redundancy — failed,” the GAO official pointed out. An investigation identified “design and manufacturing issues.” According to a Special Acquisition Report (SAR) released recently by the Department of Defense (DoD), Boeing has initiated the rework of all cesium units for SVs 3–12. “The cost and schedule impacts are as yet undetermined,” the GAO report stated. In 2009, interface compatibility issues were identified between the IIFs’ navigation data unit (NDU) and the government-provided Nuclear Detonation (NUDET) Detection System (USNDS) units. The contractor-proposed solution met requirements, according to the GPS SAR, but limited the amount of operational flexibility to support the USNDS mission. This led the Air Force to pursue interface modifications in a successful redesign efforts that resulted in an additional $21.2 million payment to Boeing. Earlier in the program, an investigation into a factory test anomaly determined that the IIF’s L1 transmitter signal power would have to be reduced from previous settings to “maximize hardware reliability,” which would cause an approximate 40 percent reduction in operational signal power. The GPS program invested $4.6 million and developed a hardware solution restoring L1 power levels for three SVs. The space acquisitions report can be downloaded from the GAO website.